What else would you expect to be on this cover? I think I'd like my triceratops prepared like a pig in old cartoons, you know: on a platter with an apple in its mouth. I guess maybe it would have to be a watermelon or pumpkin in this case. An apple would look pretty goofy (because it's so small and a triceratops is so big, you know). This hungry SOB has got to be one of the ugliest dinosaur reconstructions I've seen. We won't even start with the anatomical inaccuracies. Gross disregard of tyrannosaur anatomy. Apparently, you can get a closer look at Stewart's Petrified Wood in Holbrook, AZ. I definitely intend on it myself. You may remember when the pachycephalosaur Dracorex hogwartsia was revealed to the public. The reason it garnered the amount of publicity it did was that its specific name (that would be the "hogwartsia") was inspired by a certain series of novels which in turn inspire hysteria in children. It was considered striking enough to grace the cover of the December 2007 issue of Nat Geo, featuring the John Updike article Big Bad Bizarre Dinosaurs. 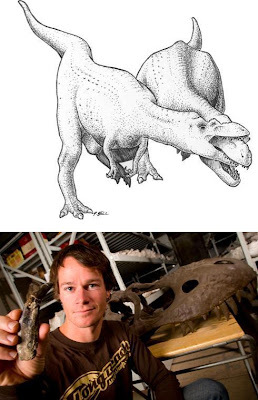 Not to burst any muggle-bubbles, but according to Jack Horner and Mark Goodwin in Extreme Cranial Ontogeny in the Upper Cretaceous Dinosaur Pachycephalosaurus, Dracorex and the slightly larger Stygimoloch aren't unique genera at all: they are juvenile specimens of the iconic "bone-head" Pachycephalosaurus. Horner and Goodwin took a close look at the available specimens and determined that they clearly share characteristics of juveniles. Their bones were still growing, and their domes weren't fully fused. Though we may lament the loss of two such colorful dinosaur names, this does bring the pachycephalosaur family more in line with the ontological (a fancy word for growin' up) development of other dinosaurs, such as the ceratopsians and crested duck-bills, as well as birds like the modern cassowary. In all of these, juveniles begin with much different head ornamentation before developing ostentatious adult characteristics fairly quickly during puberty. I've decided on a whim to start a new recurring feature here at LITC: Oh Shoot Me. OSM will highlight the most awfulest prehistory reportage the mainstream media has to offer. T-rex was a wimp. The recent discovery of a fossilized skull in England crowns the new king of predatory dinosaurs: a 53-foot “sea monster” called a pliosaur. Want another gem? Cool, okay! Experts believe that the skull - which measures over 6-feet - contains the largest dinosaur jaw ever found in England, or the world, and that it means pliosaurs were powerful enough to rip a small car in half. Seriously? We've confused people enough by calling a pliosaur a dinosaur. We're going to muddy it further by saying it could rip a small car in twain? If vehicular destruction is going to be our preferred measure of a prehistoric beast's bite strength, couldn't we pick a small submersible or motorboat? Though the mistake is called out by one of the post's commenters, this is the comment I'll take away from it, courtesy one ezekiel14: "Gosh, even in prehistoric times did John Kerry get eaten alive by Karl Rove." Not sure where ezekiel14 got a stale political jab out of the article, but large props to him for it. I've featured some numb-skull reporting in the past, but I think I'll present it in this format in the future. I'd like to hope it will be a rare occasion, but that's not very realistic, is it? The Australian Age of Dinosaurs website is hosting a few videos from a recent prime time documentary about the discovery of the dinosaurs Australovenator, Diamantinasaurus, and Wintonotitan. It aired on the program "Sunday Night" in September. Strangely enough, the program uses clips of the utahraptors from Walking with Dinosaurs, uncredited, though they do credit another WWD clip used to depict the environment of early Cretaceous Queensland. The animated reconstruction of Australovenator is colored similarly to the WWD utahraptors, so maybe the editor got confused. The presenter must have been similarly confused; he refers to Australovenator as a "raptor," whereas it was actually a member of one branch of the allosaur family. I am glad to hear that Australian TV uses didgeridoos as audio shorthand for Australian-ness the way we do in the States. And next time you're in Romania, be sure to make time to drop by the Moldova Mall. They've got a little exhibit set up featuring these three dinosaurs. I wish the marketing director for my mall would get an itch to do this sort of thing. It would probably mean displacing a pushy cell phone or facial cream salesperson's kiosk, but that's a fair sacrifice, isn't it? We'll just say this is a dinosaur. Because it's cool. Yesterday I noticed a new member in one of the Flickr groups I follow. He's a fellow named Leif Beckmann, from Germany, and he has posted some photos of his resin models. They are wonderful. Here is his model of the Jurassic ammonite Kosmoceras castor. Obviously, this is not a dinosaur, but it was a contemporary, so it counts. He is also working on a trilobite, and is currently posting photos of the work in progress. I find each stage of its assembly beautiful in its own way. This week we were introduced to Fruitadens haagarorum, North America's smallest known dinosaur, a Jurassic ornithischian from the Fruita Paleontological Locality. Fruitadens is a heterodontosaur, which are among the most basal members of the proud ornithischian family, which would also produce such classics as the duckbills, the ceratopsians, and the stegosaurs. It was likely an omnivore, an opportunistic feeder who would have eaten a variety of plants and critters. The fossils have been sitting around at the Natural History Museum of Los Angeles County for thirty-some years, but were just recently identified and named. I'd like to go on record as thinking that this little dude would look real cute with raccoon-like coloration. Seems fitting, doesn't it? Get on it, paleoartists. This is a very strange, hallucinogenic scene from the PBS documentary series "The Dinosaurs!" I love how the T. Rex is just chilling there on the sand dune with her chicks when the trike just up and charges. Then it tumbles down the dune and after a perfunctory slash at the T. rex's belly, submits to playing the role of dinner. I'm sure your average cheetah would love to have an antelope lie down in front of it and invite it to take a bite. This series was from the early nineties, right before the nature of dinosaur animation was changed forever by the good folks at Industrial Light and Magic. It took a few seconds, but suddenly it came flooding back to my mind from the hoary halls of memory. I remember watching this. May have been my introduction to Bob Bakker. I'm surprised by how little information about the series I've found on the web. Here's an entire episode from the end of the series, dealing with the K-T extinction. It's an hour long, so please, feel free to kick back with a box of Little Debbies and increase my time on site average! "Now the place where the griffins live and the gold is found is a grim and terrible desert. Waiting for a moonless night, the treasure-seekers come with shovels and sacks and dig. If they manage to elude the griffins, the men reap a double reward, for they escape with their lives and bring home a cargo of gold—rich profit for the dangers they face." Paleontology is a young science. It required quite a bit of set-up; the long history of the Earth and the workings of its rock strata had to be established by geologists. But the subjects of its study, the fossilized bones of ancient animals, have been around millions of years, exposed by the implacable processes of erosion. So before the first paleontologists took to the field, what did we humans make of these odd, bone-like rocks sticking out of the ground, gazing down at us from cliffs? [The mastodon nasal cavity] looks like a gigantic eye socket. And so, you find the skull inside of a cave when you're shipwrecked. Sailors probably told these tales, and they said, "We found not only the skull of the giant ogre, but there were all sorts of bones throughout the cave! It obviously preys on shipwrecked sailors like us. We were lucky to escape." It turns out that just by following that story from the Scythians who lived in Central Asia back to its source, I did discover that that area where they were mining gold was also perhaps a nesting ground of protoceratops dinosaurs. When I look at the skeleton of a protoceratops dinosaur, it's about the size of a wolf or a lion; it's got four legs. But its head has a beak. There is a frill on the back of the neck that could be taken for wings in and profile. These fossils are found just before you reach the gold which is eroding down from mountains. That could be said to be guarding the gold. Pretty cool stuff. But you know, for as much mythology has contributed to our culture, and though mythological stories can be deeply resonant... I'll take a scientific understanding of dinosaurs any day. 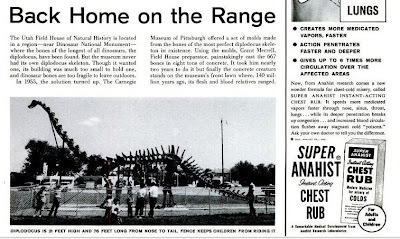 From the Oct 14, 1957 issue of LIFE. A good ol' mid-century tail-dragging sauropod. Google Books is such a wonderful thing. Lest we think that H1N1 has no precursor, checkout the Bufferin Ad on page 3: Some Questions and Answers about ASIAN FLU (their caps). From the makers of Dino Run. More pixel art here. The belle of this week's ball is the new Jurassic pterosaur Darwinopterus modularis. Image by Mark Witton, via flickr. The reason for the excitement about D. modularis? It's the first pterosaur we've found that neatly straddles the two big lineages of pterosaurs. The first, more basal group are small and typically have long tails. The second are the pterodactyloids, which included the giant pterosaurs and those with the gaudiest head decor. They also lack tails. D. modularis posesses a mixture of the two groups' traits: the head and neck are very much like the pterodactyloids while the rest of the body, with its large fifth toe and long tail, is quite basal-looking. This is a huge find for pterosaur researchers, as it fits neatly into a gap they've been looking to fill for two hundred years. Mark Witton has a fine write up on the fossil and its implications here. I like how his Darwinopterus is getting ready to devour Anchiornis, whose paleontological spotlight it's just stolen. Cute. 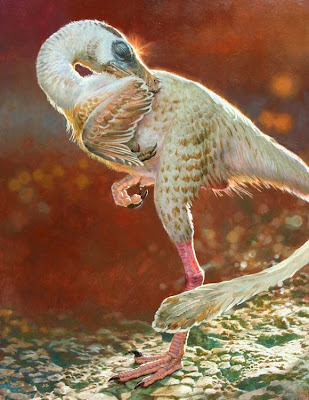 At his blog Gurney Journey, James Gurney recently wrote a couple of posts dedicated to his illustration of the small Chinese troodontid Mei long for Ranger Rick Magazine. Remember Ranger Rick? I had no idea it was still around. One of my favorites from the old days. Anyhow, Gurney decided to depict Mei in a sleeping posture. The holotype of Mei - the fossil from which it was first named and described - is a remarkably complete and intact full-body specimen, curled up as if asleep. Gurney studied the way living birds sleep. Learning that most sleep standing on one leg, he chose that as his pose. I love the flamingo-like coloration. I'm so swamped with work I risk fossilization! Simply anaerobic up in here. So with apologies for not having time to say more than this, I can at least share another dino-themed browser game. Another fine distraction for when the database at work lags and I can't stand to sit there idle for twenty seconds. I give you... Dino Run, by Pixeljam. Yup. 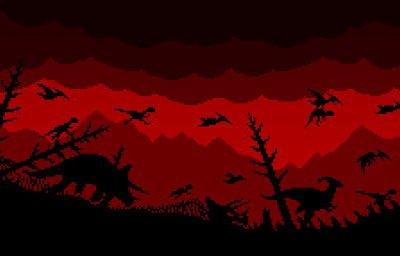 Dino Run. You're an indistinct theropod, running from flaming doom. This one is a proper browser game which doesn't require any fancy players or plug-ins. So run along, little maniraptor... run along. Tonight, the National Geographic channel will be airing Dinosaurs Decoded, which premiered on Sunday. The program explores the issue of how dinosaur ontogeny - how they changed as they matured from infancy to adulthood - raises questions about what species are "real" and which are simply juveniles of previously known species. For instance, is Nanotyrannus actually a young T. rex? 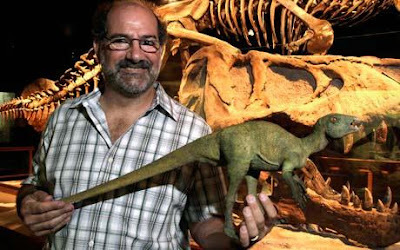 Paleontologists Jack Horner and Mark Goodwin put forth the theory that perhaps as many as a third of all known dinosaur species are actually juvenile forms of other species. Free browser games are the secret to cubicle survival and, possibly, lasting satisfaction in life. Luckily, Blurst has a couple of dinosaur themed games available. You'll need to download the Unity Player. Blurst games kind of look like Gamecube games, so they're a little more high-tech than your standard quick-loading flash game. Off-Road Velociraptor Safari: You drive around in a jeep, trying to catch velociraptors. The controls are a little jank, though this could be due to the fact that I'm playing on my five year old desktop, with the keyboard controls. Mega bonus points for the fact that they feature feathered velociraptors! Jetpack Brontosaurus (Coming Soon!) from Flashbang Studios on Vimeo. I'm going to go ahead and ask that you bop on over to the super dino blog Dinosaur Tracking, written by the knowledgable and charming Brian Switek, and vote on today's poll: which dinosaur (from his own list) would you like to see in the long-rumored but stalled Jurassic Park 4? 1. Oviraptor: The first time I saw Oviraptor, it blowed my brain up real proper. Such a strange head, and now that we know it bore feathers, it's time to give it some bigger exposure. One of the great dinosaurs, for sure. Let's see what ILM could do with it. 2. Amargasaurus: Switek's sauropod wish is Nigersaurus. Can't fault that, but I think people would go bonkers for fin-backed Amargasaurus. 3. Styracosaurus: One of the wildest ceratopsians. Heck of a head. 4. Troodon: Always one of my favorites. Maybe not much of a threat to the protagonists, but I'd love to see those big eyes come to life. 5. A clever plot and well-written characters: Perhaps more improbable than genetically engineered dinosaurs. When will this avalanche of tyrannosaur news stop? I'm not burnt out yet, but it would be nice to read some crazy hypsilophodon news. A new study from the University of Alberta, authored by PhD candidate Philip Bell and paleontologist Philip J. Currie, offers another example of interspecific fighting, this time in the Gorgosaurus branch of the family. Gorgosaurus was a mid-size tyrannosaur known almost exclusively from Alberta. Gorgosaurus is the predator with the highest representation in this area's fossil record, so it's very likely that this is Gorgo-on-Gorgo violence. Tragically, the wound shows no sign of healing, so the victim probably died soon after the incident. When I first saw it, I thought to myself, "David, that illustration looks strangely familiar. It reminds me (and therefore you) of another artist's style." It didn't take long for me to figure it out: it looks like it could be the work of one Nicholas Gurewitch, whose now-on-hiatus comic Perry Bible Fellowship is wonderful, cool, and supremely fabulous to the extreme. Here's an example of a dinosaur in his work. Maybe I'm nuts, but Philip Bell's drawing looks like what Gurewitch might do if he tried his hand at scientific illustration. I guess it's the stippling and the prominent outline. I'm not accusing Bell of using a ghost-artist, but I wouldn't be surprised if he was influenced by Gurewitch. It's probably just a coincidence, but I'm going to go ahead and email Bell to find out. If the response is interesting enough, I'll post it here. UPDATE: Heard back from the man. No connection. Pure coincidence. Since the tyrant lizards have been in the news so much lately, I figured I'd write a bit on our best known of the early tyrannosaurs, a beast discovered in Late Jurassic rock in China and named Guanlong. The other Jurassic tyrannosaurs are not nearly as well known. We have two relatively complete Guanlong specimens, an adult and a juvenile. While many tyrannosaurs feature head ornamentation of some sort - bumps, spikes, or small crests, Guanlong's head bore a large, delicate crest which in profile looks somewhat like that of Dilophosaurus. Like the early Cretaceous Chinese tyrannosaur Dilong, it's likely that Guanlong was covered, at least partially, in hairy "proto-feathers." These would have been for warmth and display purposes, and the later giants of the family show no evidence of them, and would not have needed them to maintain their temperature as their large size would have done that job just fine. Both Guanlong and Dilong had three fingers; recently described Raptorex is the earliest tyrannosaur to bear the distinctive two-fingered hand. National Geographic published a nice article on Guanlong in July of 2008, and the site also features a gallery dedicated to the fossilized mud trap where Guanlong was discovered with a whole mess of tasty fossils. The tyrant lizards are on a certified hot streak right now. Chomping up column inches like baby hadrosaurs. Do we still use the term "column inches" in the digital age? The news today is that a new Asian tyrannosaur of the Alioramus genus, named Alioramus altai, has made its debut in a paper published by the National Academy of Sciences. This new tyrannosaur was on the small side for the family, with a less robust snout (though it was decked with horns) and finer teeth. A. altai's lighter body plan probably allowed it to go after smaller prey than its larger neighbor in Late Cretaceous Asia, Tarbosaurus. Lots of buzz about this one today: Paleoblog, Dinosaur Tracking, and a post by lead author Steve Brusatte at Archosaur Musings. Catching up on NPR's Science Friday and ran across a segment on Raptorex featuring an interview with Paul Sereno, or as Ira Flatow calls him in a typically graceful introduction, "Paul Salerno." He also repeatedly calls Raptorex a "tiny T. rex." Is it so hard to understand that the word tyrannosaur is a perfectly acceptable generic name for the whole family? That way, you don't drive nit-pickers completely crazy. I loved Sereno's response to Flatow's question about whether Raptorex is a missing link, too. "I cringe when I hear the words missing link." Sereno also drops a little teaser that he's got another find he'll be revealing in coming months that will also be changing perceptions of dinosaur evolution. Can't wait to see what that is. I don't hold Walking With Dinosaurs as a sacred piece of mesozoica. I enjoy it, and I do occasionally turn to it on a sleepless night as I wait for the stubborn sandman. But if I did hold it in such a regard, that faith would have take a serious hit this morning. This problem arose from specimens collected from the Cambridge Greensand. The specimens were deposited within the Greensand from elsewhere, perhaps from moving sediments or as fossils eroded from other rocks and re-deposited. In many cases, the age and location of the original deposition is unknown. So, we've got a group of pterosaurs which are known from bits and pieces, a number of which were redeposited from their original resting places. So why the heck did the WWD team decide to cast an ornithocheirid as the noble hero of their "Giants of the Skies" episode? Why not a better known pterosaur, one that is established as being a true species? If a giant was what they wanted, why not Quetzalcoatlus? If a visually arresting pterosaur is what you're looking for in a lead actor, there are plenty of fine candidates. Though I'm no pterosaur expert, I've not found anything online that disputes Pursglove's post. Seems like the WWD gang drank some silly juice when they were writing that episode. Just ran across a cool gallery at New Scientist called Monsters of the Skies, running down some of the giant avian theropods and pterosaurs of antiquity. Featured are Haast's Huge Eagles from New Zealand's golden days as a haven of avian megafauna, Cessna-sized Argentavis magnificens from Miocene Argentina, and the magnificent Azdarchid pterosaurs. 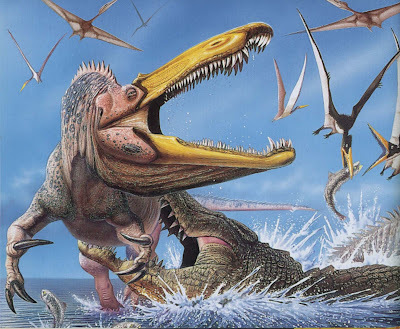 And my reasoning for this post is betrayed: it's an excuse to feature another Mark Witton pterosaur illustration. This time, it's the iconic azhdarchid Quetzalcoatlus nothropi, caught in the act of raiding a tyrannosaur nest. For the sake clarity, those are indeed baby tyrannosaurs - azdarchids were huge, but not that huge. I might be laying it on a bit thick with all of this "avian theropod" and "extant avian dinosaur" business. From now on, I'll stick with the perfectly acceptable and beloved word "bird." 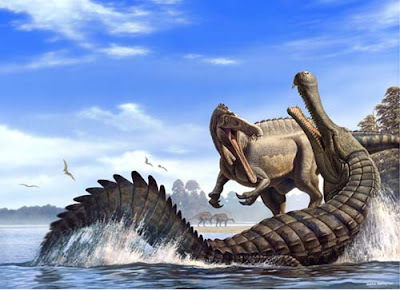 But I'm also going to officially remove the Cretaceous barrier when discussing them. If a particularly charming titmouse ends up in my viewfinder whilst dining at my suet block, well, I'm not going to worry about justifying posting the photo here at LITC. I'm happy with this decision. It feels, in the words of Larry David, "pretty, pretty, pretty good." BIRD: But I'm Really a Dinosaur! You may be interested in the lecture Sir David Attenborough gave at the recent Society of Vertebrate Paleontologists meeting, dealing with those extant avian dinosaurs called the birds of paradise. Watch it here. 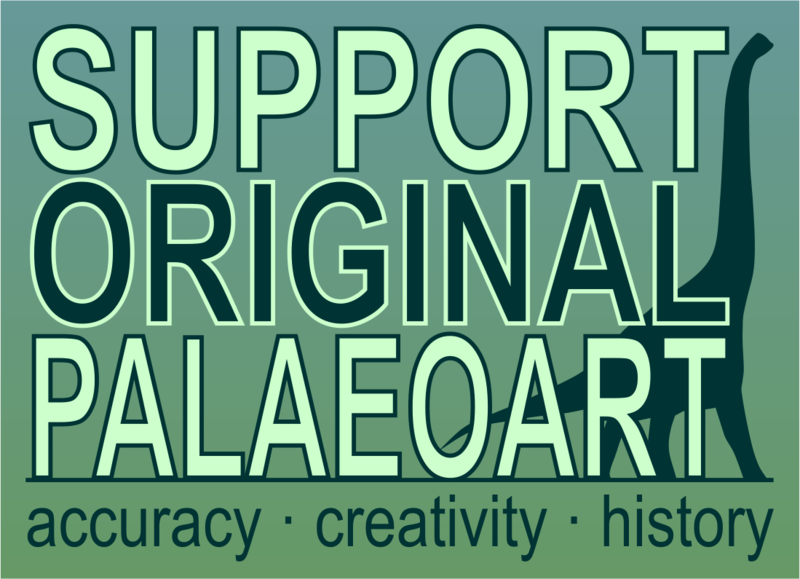 Thanks to Dave Hone of Archosaur Musings for the tip. Yeah, I just called birds of paradise "extant avian dinosaurs." I'm through with cautiously referring to birds as possibly being descended from dinosaurs. I mean, I've believed it for a while, but when I started this blog I wanted to avoid the appearance of being invested in it. Because let's face it, it's cool that birds are dinosaurs. And the allure of that coolness made me feel a little sketchy. I guess I have Anchiornis to thank for the fact that I suddenly feel 100% comfortable taking a side, and I'm taking the one with the best parties: BAD. Birds are Dinosaurs. There is no point in sitting on the fence for the sake of false objectivity. Birds are derived theropod dinosaurs. Dinosaurs didn't go extinct. They adapted quite well, actually. In just under two months, Americans will feast on millions of factory farmed avian dinosaurs called "turkeys." I'll refer to Hone again: read this. I have my own acronym to offer up. BIRD: But I'm Really a Dinosaur!